Hamerkop ( Scopus umbretta fam. Scopidae) Kruger Park Birds & Birding. 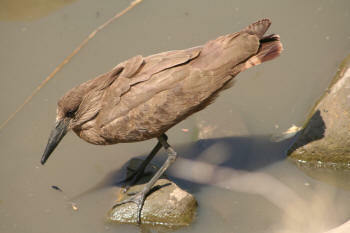 The Hamerkop (Latin name Scopus umbretta) is described in Roberts Birds of Southern Africa, 7th Edition. This bird has a unique Roberts number of 81 and you will find a full description of this bird on page 603 also a picture of the Hamerkop on page 593. The Hamerkop belongs to the family of birds classified as Scopidae. According to the Percy FitzPatrick Institute of African Ornithology the Hamerkop is also known by these other names: Hammer-head Stork. The map of the Kruger you see on this page shows the areas (coloured orange) where this bird has been identified. In terms of distribution of the Hamerkop in the Kruger National Park you may see it in all areas. Smaller animals and aquatic life forms. The nesting habit of Hamerkop is to create the nest in branches of a tree or shrub or on the ground or on close to water. The bird lays eggs which are brown in colour and number between 3 to 9. 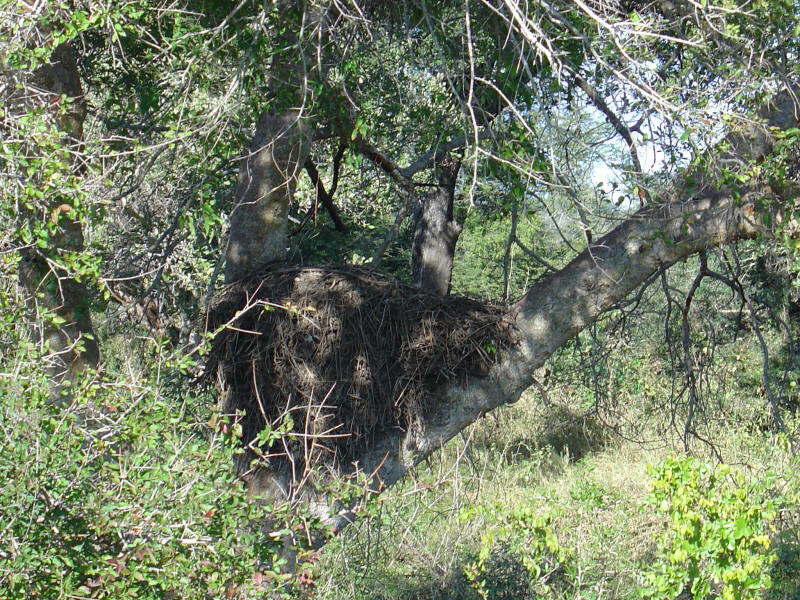 Take a look at this nest here ... picture taken on morning walk close to N'wanetsi River at Satara. The Hamerkop only uses the nest once which sems a bit of a waste if you take a look at the work that must have been involved in building such a large and complex nest. The preferred habitats for Hamerkop are: wetlands. The bird prefers to act singly or in pairs.